At What Age Can I Withdraw Funds From My 401(k) Plan? When Can I Withdraw Funds from My 401(k) Without Penalties? Have a 401(k) retirement account? Wondering when and how you can start tapping into your tax-free savings? Different rules apply at different ages. The lower your age, the fewer your options, especially if you're not yet retired. This can be frustrating if you need the money for non-retirement expenses, but the idea of a 401(k) is to ensure you're financially solvent when you retire. If you're under age 55, and you still work for the company that manages your 401(k) plan, you'll have only two options (assuming the options are made available by your employer). To tap 401(k) funds, you'll need to either take a 401(k) loan or a hardship withdrawal. If you're no longer employed by the company, you can roll the funds over to an IRA, or cash in the 401(k) plan. Think twice about cashing in: if you cash in you'll void valuable creditor protection that stays in place when you keep the funds in the plan. If you retire the year prior to reaching age 55, the 401(k) retirement age 55 provision will not apply. Your withdrawal will be subject to a 10 percent early withdrawal penalty tax. For example, assume you retire at 54, thinking in one year you can access funds penalty-free. Nope, sorry. You needed to wait one more year to retire for that provision to apply. If you roll your 401(k) plan over to an IRA, the retirement age 55 provision will not apply. The earliest age at which you can withdraw funds from a traditional IRA account without penalty taxes is age 59½. Once you reach age 59½ the rules change a bit, but access to your 401(k) funds at age 59½ depends on whether you are still working or not. Retired. If you are retired, terminated employment after reaching age 55, and still have funds in your 401(k) plan, you can access them at age 59½ and pay no early withdrawal penalty tax. 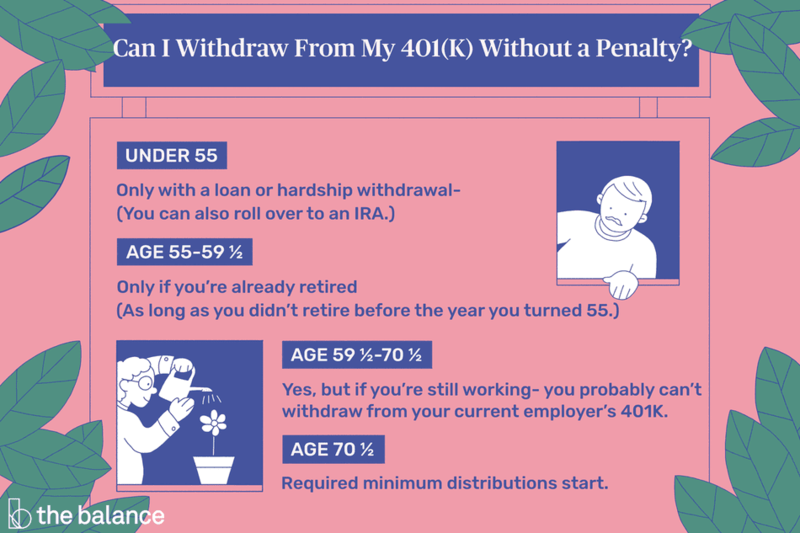 If you have rolled your 401(k) funds to an IRA, the rules are the same: age 59½ is the earliest you can withdraw funds from an IRA account and pay no early withdrawal penalty tax. Still working. If you are still working, you can access funds from an old 401(k) plan once you reach age 59½, but you may not have the same access to funds inside the 401(k) plan at the company for which you currently work. Check with your 401(k) plan administrator to see if your plan allows what is called an “in-service” distribution at age 59½. Some 401(k) plans allow this and others do not. Age 70½ is the age that required minimum distributions start. At this age, in general, you must begin taking distributions from all your tax-deferred retirement plans (plans like IRAs and 401(k)s). If are still employed by the company that manages your 401(k) plan, you are not an owner, and you do not wish to take a distribution, your plan may offer an exception to these mandatory distributions. You will have to check with your plan administrator to see if they allow an exception to the required minimum distribution rules if you are still working at age 70½.